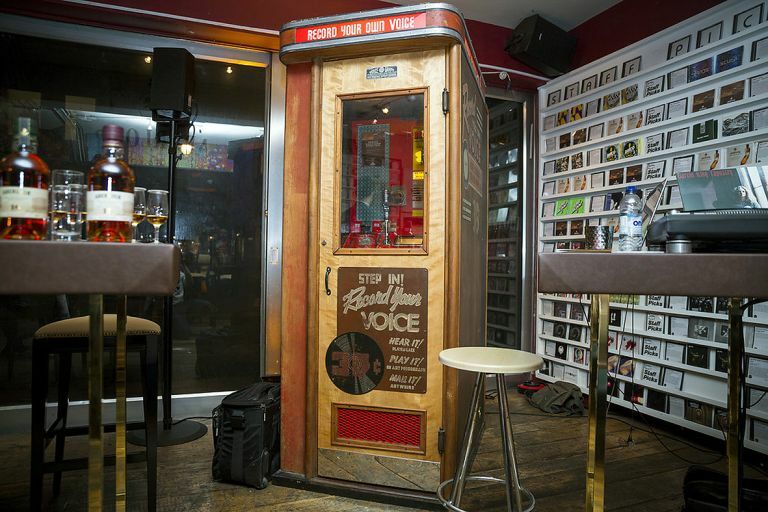 There are only two Voice-O-Graph recording booths left in the world. One is round at Jack White's house and the other is in Soho, London's Phonica Records for the next two weeks only. Voice-O-Graphs used to be commonplace in America's malls and transport hubs and were also to be found in the UK. In the movie adaptation of Graham Green's Brighton Rock, 1940s original gangsta Pinkie uses one to record a message to his wife about how much he hates her. Aah. Isn't that nice? The machines are essentially a recording booth attached to a record-cutting lathe, so the recordings made in them could be instantly transferred to six-inch diameter, shellac-coated cardboard discs. Yes, cardboard. This was not an audiophile product. The booths were more commonly used to send voice messages to and from troops based overseas, for aspiring musicians to record tunes and, presumably, for drunk people to record two minutes of themselves making fart noises and doing funny voices. A timer would tick down, with a warning light indicating that there was just 30 seconds till the end of the alloted recording time, which means that many Voice-O-Graph recordings start with people talking rather slowly and then accelerating as they realise they've nearly spent their quarter/shilling. Our list of the best USB turntables is here. Now, courtesy of one of those weird tie-ups between big business and independent artistes, Aberlour whisky, part of the mammoth Pernod-Ricard conglomerate, has brought a Voice-O-Graph to London's celebrated independent, electronic-music vinyl specialist Phonica. Until November 2, you can see the box and, indeed, make your own recording in it. Musicians are welcome to bring instruments, although tuba players may be out of luck, given the Voice-O-Graph's cosy dimensions. Here's how it works: you go in and record yourself doing whatever, having downed a wee dram of 12-year-old Aberlour single malt. Your magum opus/beautiful, romantic outpouring/drunken shambles is cut to a vinyl disk (the machine's been upgraded). You listen to it back whilst pulling a quizzical expression. The quizzical expression is actually mandatory, but the Scotch is only on offer at the following times: October 22-23 and 29-30 from 5-7pm and October 24 and 31 from 4-6pm. Either way, there's no charge. I saw the machine in action on Monday, and the recordings it produces drop out of the machine sounding like they were recorded in the 1930s, by someone now long dead. The timing and pitch of the lathe-cut vinyl are absolutely all over the place, giving a ghostly effect that's like intercepting a haunted transmission from the past. So long as you don't just record yourself making fart noises and doing funny voices, anyway. The Voice-O-Graph moves on to Canada after its sojourn in London. For more info visit Aberlour and Phonica.